CPB hosted a private reception May 17 to honor Jennifer Lawson, its senior executive of television and digital content, who retired this month after nearly 30 years in public media. Lawson received the 2016 Ralph Lowell Award, CPB’s most prestigious recognition of individuals for achievements and contributions to public TV. 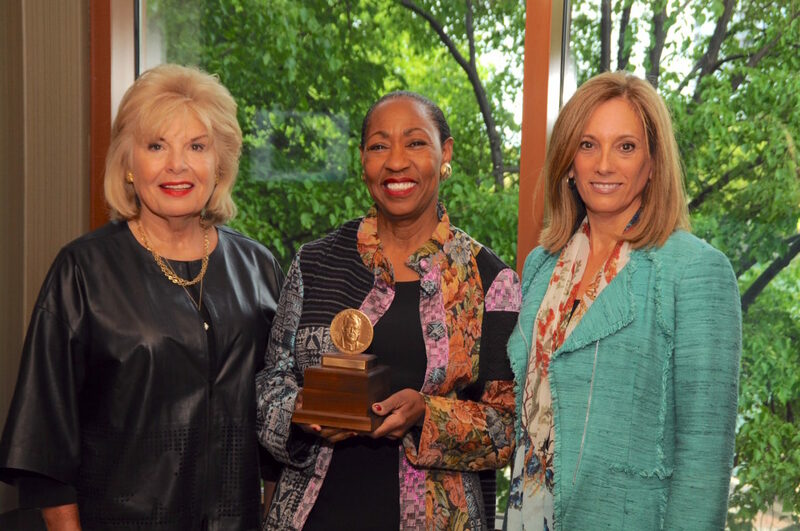 CPB Board Chair Elizabeth Sembler, who presented the award, lauded Lawson for “groundbreaking leadership that yielded some of public television’s greatest successes.” Her acceptance remarks have been edited for length; read the full speech here. Thank you for this incredible honor. I humbly accept this recognition only if you acknowledge that accomplishments I have made in public media depended upon the work of so many others. At its core, public media has always been collaboration between all of us and a receptive audience who finds meaning in what we offer. I studied film and television, and came to work in this industry because I believed then, as I do now, that these technologies can make a difference in people’s lives. Our schools were substandard, stocked with second-hand textbooks and equipment passed down from the local white schools after they had become obsolete. Our schools were pathetic by today’s standards, but my classmates and I were educated and nurtured by caring women and men, teachers and principals, and our parents, who believed deeply that education and information could lead one away from poverty, racism and deprivation. They instilled in me a belief in the transformative power of education. I have grown to think that media, given their ubiquity, play a far more powerful role than formal education. We are all constantly learning and getting information from our screens and electronic devices. Lawson speaking during the 1992 PBS Annual Meeting. The question is, what are we learning? What is the quality and value of the content? Will this content help our children avoid the mistakes of history and propel civilization forward? Does it inspire us to understand our world, its cultures and make new discoveries? Public media is essential in providing information with integrity, quality, diversity and transparency of perspectives. And in this day and time, it is more essential than ever. Public media has played an important role in safeguarding our democracy and our culture. It has created a growing, vital document of who we are as a nation in a manner that no other institution can rival. Sometimes I fear that we’ve lost sight of how precious that is. If you need documentation of our history, all of our wars, presidencies, biographies of great American leaders and thinkers, you’ll find it in the vaults of public television. You’ll see Martin Luther King Jr. dreaming, and you’ll see the nightmare of poverty, inequality and deprivation. Our history is documented on public media from the earliest known days of Native American life on this continent to the Civil War, the Dust Bowl and the current days of the Obama presidency. Public television has documented a multitude of national events, and in many places it has uniquely captured the spirit of local communities with granularity. Oregon’s field guide, Maryland’s Chesapeake, Carolina’s byways, Pittsburgh’s neighborhoods and Chicago’s architectural gems — these legacies are all available to us because of public media. While there is richness to the history and culture being captured and stored, please do not think that public media is a dusty archive in the attic. Far from it. I am privileged to have visited public media stations in almost every state from Alaska to Arizona, and to have managed a public media station in our nation’s capital. These stations are places where discussion and debate occurs, places where citizens can disagree on contentious issues without rancor; where people are not competing to out scream each other. To keep our democracy strong, we need places like this, now more than ever. I have been reflecting on my career in public media and the lessons I take with me as I retire. It all really boils down to this: We are most successful when we stay true to our mission and combine the collective power we have; when we work together to stand for quality, take risks and serve all Americans. We must stand for education and provide essential information. The American Graduate activities and PBS Kids service demonstrate to communities and families our seriousness about connection to education. We must resist the temptation to fill our air with British comedies or other lighthearted fare with little societal value because, ultimately, we will be called to task on our distinction and worthiness of public support. With our own productions, we often have a hard time with blending truth and beauty. This is a critical problem and a continuing weakness. We have far too much worthy content that denies the human need for storytelling, humor and nuance. There are many series where we get it absolutely right and the audience, the awards, accolades and continued demand bears witness to the quality. Public media must accept the challenge of reinventing and reinvigorating itself routinely. If we tell powerful, engaging stories with artistry, using the full language of the media, we will not only retain audiences, we will grow and take public media to younger generations. Recently podcasting has been a breakthrough area. Online digital series are also appealing to younger audiences. Experimentation, creativity and risk-taking should be encouraged. In the late 1980s, when I headed the TV Fund at CPB, I worked with PBS executives to convene a conference of public television’s top producers at Hilton Head, S.C. We challenged the producers to think about the appeal of their work and encouraged them to take risks. They were quite skeptical at first. But over the years it has been heartening for me to hear from producers that it did make a difference in the way they approached their work. We must take risks and embrace change. We have funded and aired numerous experiments, and I think we were all the richer for it — programs like Alive from Off Center with the Walker Arts Center in Minnesota. Dare to take a chance. Try something different. If it doesn’t work, stop doing it. Try something else. This is a formula that has worked from public media’s formative years, and will continue to work despite whatever technological and demographic changes are in store. Our country is becoming younger and more diverse. Millennials are now the largest generation. Latinos, African Americans, Asian Americans and other cultural groups are increasingly becoming the majority. If we do nothing to attract them as viewers, we risk becoming out of sight and out of mind to this important, defining generation. We must try new program ideas, aggressively seek out new artists, producers and thinkers, and bring them into the public media community. Otherwise we risk becoming irrelevant. Viewers are being bombarded with choices — on-air, over-the-top, online and on other platforms. In this environment we must remember that our values are our identity, and we must think carefully about what defines us. I sometimes encounter people in public media who are anxious about the future of public media, but I am very bullish and optimistic. Public media is as central to our democracy as a free press. It is an essential part of the public square in a technological age, true to the vision of WGBH founder Ralph Lowell. It is important to keep public broadcasting strong and growing. We must stand on the principles espoused by the Public Broadcasting Act of telling the stories of the unserved and underserved. I hope you’ll continue to ensure that public media stands for something important, beautiful and truthful. In accepting this award, I’d like to issue a challenge to those present to treat public media as the rare treasure that it is, protect it and to grow it for future generations.